Harry Bourchier triumphs on home soil. Harry Bourchier is the champion of the Mornington Penisula Men´s Tennis International#1 held at the Mornington Tennis Centre on clay-courts. The 23-year-old Tasmanian started his way to the final with a two-set win against Naoki Takeda from Japan. In the next two rounds the No. 2 seed stopped the way of his talented Australian compatriots 18-year-old qualifier Thomas Bosancic and current No. 16 in ITF Junior rankings Rinky Hijikata, winning both matches in straight sets. Making it into the quarterfinals has been the best result on the Pro Circuit for 18-year-aged Hijikata, who is coached by Jarred Bunt at Sydney National Academy using his excellent junior ranking to enter the competition. The last step to the final was made by Bourchier with a tough three-set battle against 24-year-old and No. 3 seeded Australian Thomas Fancutt to get succesful revenge for his loss on grass against his countryman last year in Mildura, Australia. Runner-up Christopher O´Connell made his great trip to the final without dropping a set. The 24-year-old Australian opened the tournament with clear wins against Australian wild-card-entry Calum Puttergill and Kazuma Kawachi from Japan, followed by tight-set wins versus Australian Aaron Addison and 22-year-old Luca Castelnuovo from Switzerland. In the title match Bourchier sealed the win in two tight sets with 6:4, 6:4 after one hour and 27 minutes already leading with a double-break in the final set. After lifting his first trophy on ITF World Tennis Tour, the champion said that he was very surprised to get this title on clay, because he hasn’t played on this surface for a couple of years. „Definitely always winning an event is something special. You don’t do it every week even though you’re playing so many tournaments throughout the year you don’t win that many titles so very happy to win a title and hopefully I can keep it going and win a couple more this year,” Bourchier said. Tomas Machac was the dominating player to clinch the title of the ITF M15-tournament in Bahrain held at Bahrain Tennis Centre without dropping a set. The 18-year-aged opened his tournament by a clear win versus 21-year-old lefthanded and No. 3 seed Corentin Denolly from France, who was previously No. 3 in the ITF Junior rankings. After defeating Russian Alexander Igoshin, the unseeded Czech went over 25-year-old Jeson Patrombon from the Philippines, who was former Nr. 9 in the ITF Junior rankings, and made the entry to the tournament by qualifying. In the semi-finals Machac stopped the great run of 18-year-aged Jesper de Jong from the Netherlands, who defeated top seeded Spaniard Ricardo Ojeda Lara by straight sets in the second round. In the final the next Dutchman was waiting to compete. 21-year-old Tim van Rijthoven, who didn’t drop a set en route to the final, started into the competition by a clear win versus 18-year-aged and junior-rankings-entry Arnaud Bovy from Belgium. After defeating qualifyer Worovin Kumthonkittikul from Thailand and British Isaac Stoute, van Rijthoven battled down 21-year-old Vitaliy Sachko, who went over No. 2 seed Belgian Zizou Bergs in the second round by a straight-sets win. The title-match was a clear matter for Tomas Machac celebrating a 6-3, 6-3 win over No. 4 seed van Riithoven, who is coached by former doubles career-slam-winner Paul Haarhuis. After one hour and five minutes Machac could lift his fourth overall trophy on ITF World Tennis Tour, winning three tournaments in Czech Republic last year. Kacper Zuk prevailed at the ITF M15-tournament held at Soho Square in Sharm El Sheikh without dropping a set during the competition. The 20-year-old Polish, who battled through the qualifying, started his run to the final with victories against the young guns Patrik Nema from Slovakia and Italian No. 5 seed Jacopo Berrettini. After his win versus Swiss Riccardo Maiga, who knocked off top seeded Chien Hsun Lo from Taipei in the opening round, he battled down Italian 21-year-old Enrico Dalla Valle in the semi-finals after a tight first set, winning 7-6, 6-3. Finalist Pablo Vivero Gonzalez opened the main draw campaign with a tough three-set battle against 19-year-old and No. 4 seed Francesco Forti from Italy, winning 3-6, 7-6, 6-2. The 23-year-old Spaniard went on with victories against Swiss Adrian Bodmer and No. 6 seed Botic van de Zandschulp from the Netherlands. In the semi-finals he stopped the trip of German Robert Stombachs, who fought past his countryman and former ATP No. 210 Daniel Altmaier in the second round. The title-match was dominated by the great serve of Kacper Zuk, who fired 10 aces during the encounter. After one hour and 16 minutes he got the win by 7-6, 6-3 to lift his first trophy on ITF World Tennis Tour. The Kofu International Open Tennis 2019 held at Yananashi Gakuin Yokone Tennis Center were finished by the white-wash-win of Jumpei Yamasaki. The 21-year-old Japanese opened the tournament win a win against 17-year-old countryman Keisuke Saitoh, who is currently No. 18 in ITF Junior in the rankings, and entered the competition by his junior-ranking. Yamasaki, who was previously No. 11 in ITF Junior rankings, went on with wins versus Korean No. 7 seed Min-Kyu Son and his Japanese compatriots 21-year-old top-seed Yusuke Takahashi and Ryota Tanuma. The bottom half was dominated by wild card entry Sho Shimabukuro without dropping a set on his way to the final. The 21-year-old Japanese started the competition by defeating 19-year-old and No. 5 seed Shinji Hazawa from Japan, followed by wins against the two qualifiers Masamichi Imamura from Japan and Dutchman Mick Veldheer. In the semi-final he went over Japanese Takuto Niki to make his first final appearance on the Pro Circuit. 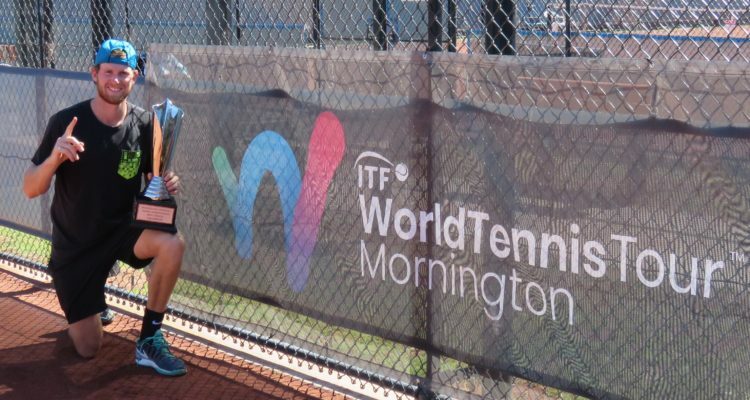 The title-match was an even match with Jumpei Yamasaki, winning 7-6, 6-3 after one hour and 47 minutes, so he could celebrate his maiden title on ITF World Tennis Tour without dropping a set during the competition. Ewan Hoyt is still the man to beat on Portuguese Hardcourts. He clinched the title at the Campus in Quinta do Lago to lift his second successive trophy on ITF World Tennis Tour after last weeks win in Portimao. The 24-year-old started the competition with a bang, defeating current ATP No. 330 and top seed Dragos Dima from Romania in the first round by a tough three-set battle 6-3, 6-7, 6-3. After a clear win versus 20-year-old Russian Artem Dubrivnyy, who is a former World No. 14 in the ITF Junior rankings, the unseeded Briton went over protected-ranking entry Finn Tearney from New Zealand by a three-set win and Brazilian Oscar Jose Gutierrez in two tight sets. No. 8 seed Manuel Guinard started his journey with straight-set victories against rookies Michal Dembek from Poland, who fought his way through the qualifying, and 19-year-old wild card entry Luis Faria from Portugal before he rallied past No. 2 seed and former ATP No. 43 Teymuraz Gabashvili of Russia in two sets. In the semi-finals, the 23-year-old Frenchman had a tough struggle versus No. 5 seed and 22-year-old Juan Pablo Ficovich from Argentina, getting the win in two hours and 51 minutes by 3-6, 7-6, 7-5. The title-match was an equal encounter with both players earning nine break points in two sets. Ewan Hoyt converted four of them by dropping two service games with 6-4, 6-3, so after one hour and 32 minutes the Mexican-born Briton captured his fifth trophy overall on the Pro Circuit, all won on hard court. Alexander Ritschard got the crown of the USTA Men’s Pro Tennis Championships of Calabasas 2019, held at the Calabasas Tennis & Swim Centre. The 25-year-old American, who entered the main draw with his ITF-ranking, started the way to the final by a three-set win against No. 5 seed Brazilian Joao Menezes. In the second round he took successful revenge against 18-year-old countryman Jason Brooksby, who defeated Ritschard in the second round by a tough three-set battle on the way to his maiden title in Bakersfield last week, winning 6-4, 7-6. After beating Altug Celikbilek from Turkey in straight sets, he made the last step to the title match in earning a 6-4, 6-4 win over top seeded Briton Liam Broady, a former No. 2 in the ITF Junior rankings and former No. 154 in the ATP rankings. No. 2 seed Stefan Kozlov was the dominant player in the bottom half of the draw, making it into the final without dropping a set. The 21-year-old American, who was born in Macedonia, opened his campaign with a win over compatriot Ronnie Schneider, followed by two victories against 21-year-old young guns Isaiah Strode from the United States and British Jonathan Gray. In the semi-final the former No. 2 in the ITF Junior rankings rallied past 18-year-old wild card entry Drew Baird from the United States, who was No. 12 in ITF Junior rankings last year. The title match ended with an epic drama in the final set. After Ritschard dominating the first set by 6-2 Kozlov, came back winning the second set without dropping any game by 6-0. In the final set, Kozlov was leading 5-2 with a double break, but Ritschard fought back, winning the match in the tie-break after two hours and 32 minutes to lift his maiden trophy on ITF World Tennis Tour. Hernan Casanova capped his dream week at 2019 Tenis Ranch Pinamar Tour 1, winning the singles as well as the doubles competition. The 25-year-old Argentine made his way to the final by beating only compatriots. After his defeat against 20-year-old Juan Bautista Otegui, who had to retire in the second set, he battled down Facundo Juarez in three sets. The No. 3 seed went on with wins against 19-year-old Santiago Fa Rodriguez Taverna, who had to retire in the third set, and former No. 7 in ITF Junior rankings Mateo Nicolas Martinez in straight sets. Countryman Tomas Martin Etcheverry was the man to beat in the bottom half of the main draw. The No. 7 seed opened the competition by clear wins over Conner Huertas del Pino from Peru and Argentine Nicolas Alberto Arreche, followed by a tough three-set win versus 21-year-old and No. 2 seed Manuel Pena Lopez from Argentina who was previously No. 11 in ITF Junior rankings. In the semi-finals, the 19-year-old and former No. 12 in ITF Junior rankings held off 20-year-old compatriot Francisco Cerundulo, winning in straight sets. The title-match was a clear matter for Hernan Casanova winning the encounter after one hour and 17 minutes 6-2, 6-2 without dropping any service game. After lifting his 14th overall singles trophy on ITF World Tennis Tour he crowned his great week by winning the doubles tournament together with his countryman Francisco Cerundulo. Dmitry Popko is the champion of Ahmet Erguden Cup 2019 held at Starlight Resort Hotel in Antalya. The man from St. Petersburg, who is starting for Kazakhstan, opened the competition with straight-set wins against Brazilian No. 8 seed Felipe Meligeni Rodrigues Alves and wild card entry Sarp Agabigun from Turkey. After beating top seed Dimitar Kuzmanov from Bulgaria in three sets, the 22-year old unseeded went on to defeat German Peter Torebko in two sets. No. 5 seed Pietro Rondoni started his way to the final with a two-set win over Austrian Lenny Hampel followed by a three-set-battle against his compatriot Georg Winkler, who made his way through the qualifying. After his three-set-win versus Ronald Slobodchikov from Russia, who defeated Colombian No. 2 seed Cristian Rodriguez in the second round, the 25-year-old made the last step to the final with a clear two-sets win over qualifier Mircea-Alexandru Jecan from Romania. The title match was an intense three-set-battle with Rondoni ,winning the first set 7-5. Dmitry Popko came back to win the next two sets 6-4, 6-1. After three hours and one minute, he finished the match to lift his third trophy in a row in Antalya, his fourth of the season. Alvaro Lopez San Martin took the singles title of the International Tenis Club de Campo Murcia 2019 held at the Real Sociedad Club de Campo de Murcia. The 21-year-old Spaniard started the tournament with clear wins over American qualifier Dennis Uspensky and his two compatriots 20-year-old Benjamin Winter Lopez and No.2 seed Carlos Boluda-Purkiss. In the semi-finals, the former No. 11 in ITF Junior rankings battled past 18-year old countryman Carlos Lopez Montagud, who was No. 11 in the ITF Junior rankings last year, winning 6-2, 5-7, 6-1. In the top half of the draw 20-year-old Javier Barranco Cosano opened the competition with a straight-sets win against 18-year-old Timofei Skatov from Kazakhstan, who was No. 1 in the ITF Junior rankings last year, followed by wins against 19-year-old Russian Yan Bondarevskiy and compatriot Jaume Pla Malfeito. In the semi-finals the left-handed No. 3 seed had to fight through two tough sets before his opponent Eduard Esteve Lobato from Spain had to retire at 5-7, 7-6, 0-3. The biggest surprise was the early loss of French top seed and former ATP World No. 116 Calvin Hemery, who fell to Spanish wild card entry Sergi Perez Contri 4-6, 4-6. In the title match No. 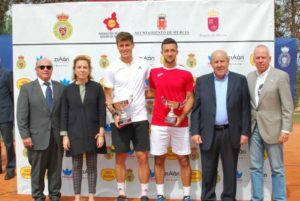 5 seed Alvaro Lopez San Martin gained the first tight set 7-5 followed by a clear 6-1 to lift his sixth career trophy on ITF World Tennis Tour, all won on Spanish clay courts. Vit Kopriva got the title of the Macig Tours 2019 held at Thabraca Magic Hotel in Tabarka. The No. 7 seed from the Czech Republik went to the final without dropping a set, starting with victories over 20-year-old qualifier Tomas Liska from Slovakia and 18-year-old wild card entry Diego Fernandez Flores from Chile. After defeating 20-year-old Frenchman Louis Tessa, the 21-year-old battled past No. 3 seeded Russian Alexander Zhurbin in the semi-finals. No. 2 seeded Spaniard Pol Toledo Bague made it into the title match without losing a set. He opened his campaign with wins against 21-year-old Frenchman Maxime Mora and 18-year-old wild card entry Samuel Puskar from Slovakia, followed by wins against No. 8 seeded Frenchman Mathieu Perchicot and No. 4 seed Joao Pedro Sorgi from Brazil who was previously No. 8 in the ITF Junior rankings. Toledo Bague secured the first set, winning 7-5, but Kopriva came back taking the second set 6-1. In the final set Toledo Bague had to retire after losing the first game, so Vit Kopriva could celebrate his fourth career trophy on the ITF World Tennis Tour, all won on clay court. This entry was posted in ITF World Tennis Tour, ITF World Tennis Tour News and tagged Alvaro Lopez San Martin, Harry Bourchier, ITF World Tennis Tour, Javier Barranco Cosano.